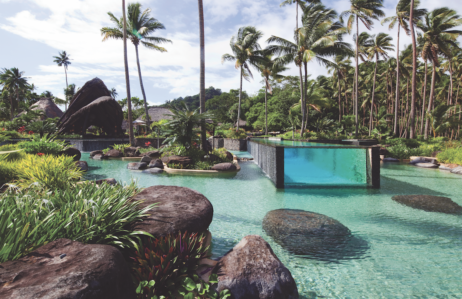 Four Seasons Resort Langkawi stretches for over a mile along one of Malaysia’s finest beaches. A haven of natural wonder and eco adventures, it reflects the drama and beauty of its Unesco Geopark location — the first in Southeast Asia. The 48 acres of vast beachfront gardens bordering the rainforest provide endless space and privacy. The gardens are dotted with 91 striking beach villas and pavilions, showcasing traditional Malay architecture with Moorish influences, and superb facilities including a multi-tiered family pool and kids’ club, 180ft adult quiet pool with private cabanas, the award-winning Geo Spa, three restaurants and the Moorish-inspired Rhu Bar. And it’s all explorable by bicycle, which are available for all ages. A daring transformation of this Unesco hideaway is underway, headed up by renowned designer, Bill Bensley. Where previously the resort blended into its mile-long beach and surrounding limestone karsts formation, the new design places the resort center stage at a new level of contemporary luxury and indulgence. Additional layers of drama include a striking cobalt-to-azure color scheme, bespoke Bensley-commissioned artworks, complete refurbishment of all pavilions and villas, new-look restaurants and restyled pools and communal areas. The wild surrounding nature of vibrant rainforests, spectacular sea and mountainscapes is the gateway to National Geographic-style experiences. Don’t miss the naturalist-led mangrove and eagle safari embarking directly from the resort’s beach. Whether traveling as a couple, honeymooners, family, group or wedding party, the abundance of natural wonder, fun activities and beachfront tranquility make this resort one of Southeast Asia’s very best-kept secrets.